There are things that even the Romans don’t know about their own city that, on the other hand, are known around the rest of the world. 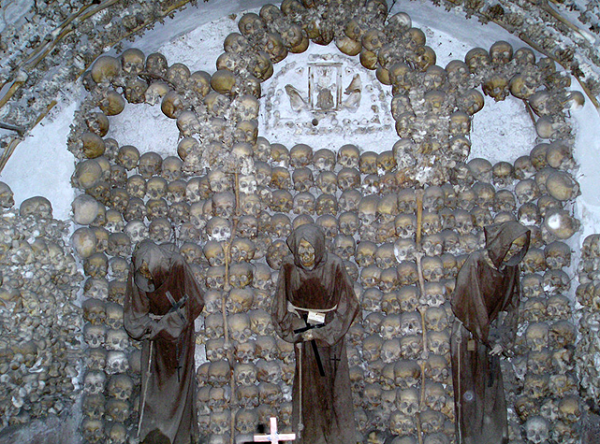 Things such as the Capuchin Crypt in Piazza Barberini, a particular friars cemetery entirely built with bones. Yes, you got it right! Every single little part, such as the chandeliers or the decorations on the walls, is made of bones. Not to mention the beauty of the actual crypts where you can find the perfectly preserved skeletons of the Capuchins still wearing the habit. It is an actual cemetery that is not comparable to any other in the world. At first glance it might seem macabre, but its magic atmosphere gives visitor an immense sense of peace. The Church Santa Maria della Concezione dei Cappuccini, or Our Lady of the Conception of the Capuchins, which is next to the crypt, was built between 1624 and 1630 by Pope Urban VIII in honour of his brother, Antonio Barberini who was, in fact, part of the Capuchin order. Better Known as “Chiesa dei Cappuccini” its peculiarity is represented by this crypt decorated with bones from 4,000 Capuchin Friars dead between 1528 and 1870; the bodies were recovered from the old cemetery of the Capuchin located in the Church of Santa Croce and Bonaventura dei Lucchesi near the Quirinale. In the crypt, composed of five small chapels, you can see the mummified bodies of monks wearing the typical dress of their order: the habit. We even know the identity of some bodies: among them you can find the Prince Orsini, Princess Barberini and three small grandchildren of Pope Urban VIII. The rose windows, the chandeliers, and the decorations in the crypt are all made from the bones of the monks, a choice that could seem gruesome at first glance, but that hides precise intentions and messages. In fact, a placard at the entrance of the crypt declares: “What you are now we used to be; what we are now you will be…”. It is a clear message to exorcise death, a hymn to the afterlife in spite of the ephemeral body that is nothing more than a simple container of our souls.